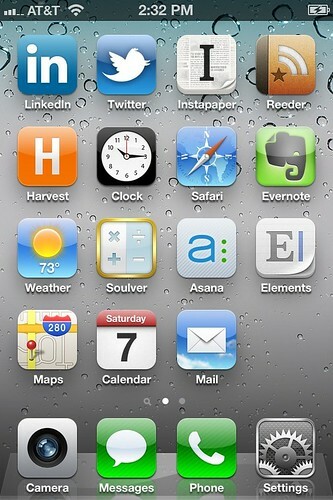 When iOS5 dropped, I used it as an opportunity to reorganize my home screen on my iPhone 4. I’d had the same three screens for about a year and they weren’t working. Plus, freshening things up would hopefully eliminate any tech-envy I felt towards those who upgraded to the 4S. So I rearranged – and rearranged – and rearranged. It got old fast. None of them worked. I was constantly hunting for stuff by flipping through screens and folders. I often ended up hitting the wrong app, sometimes a few times in a row. I had a bunch of redundant apps, so I wasn’t sure which apps to use for what purpose. I wasn’t taking advantage of Spotlight search or double-click-for-recent-apps either, which are two convenient and time saving features. But most of all, I wasn’t thinking about this issue correctly. I didn’t have the right paradigm for organizing a smartphone for business. The problem was that I was prioritizing applications instead of functions. I started doing some research and ran across a blogger discussing how he/she (I can’t even remember which) just had a single organized screen. One screen! They didn’t care where everything else went, they just used search to find stuff outside of that one screen. Wow, this spoke to me. I got to work. I thought about the functions that I need to use on a regular basis. The theory is that apps supporting these functions should be first and foremost on my phone. I wanted to be able to touch each of these functions right from my home screen. Heck, I have sixteen spots on my home screen, so I could accommodate up to sixteen primary functions. Everything else would go into folders on a third screen that I wouldn’t visit, I would just access them through search. That’s it really – the primary functions. But these aren’t primary functions, not in my view at least. They’re secondary – fun things that I will still use compulsively regardless of where they are on my phone. Think of them as icing on the cake, and I’m okay making the icing a little tougher to get to. I certainly don’t want them on my home screen, where they can be a distraction for all of the important calculating, communicating, planning, capturing, researching, and organizing that I should be doing. My business, after all, is paying for this thing. Let’s dig deeper. My dock has high usage items that need to be accessible no matter where I am – settings, phone, text messages, and camera. I’m a right-handed phone user, so I want the rest of my productivity stuff flowing northwest from the bottom right, within easy thumb-touch. Across the top is a news and information line, somewhat out of reach but still easy to get to. Then left center has a few apps that I use often but don’t need to be within easy thumb-touch. Here are notes and some links to the apps if you’re interested. Mail – I use Gmail, but access it through the native mail app. Calendar – Nothing fancy, I just use the native app. Elements – I start every writing project in this text editor. I use it for long emails, involved Facebook comments, and every post on this site. It fully supports Markdown and copy/paste to html, so it can be copied right into a web page. It syncs with Dropbox so I can access these files anywhere. Awesome. Just awesome. Asana – This is the the project management and to-do list software I’m going with now. I’ve tried a bunch of them, but I really feel this one has some staying power, mostly because I love the three panel web app layout. It’s also fast and intuitive. The mobile app is marginal, but fills the bill for adding tasks and taking notes. I expect it to get better shortly because it’s brand new and appears to be well-funded with a solid management team (according to Businessweek, at least). Soulver – I do a lot of calculating and I use Soulver rather than the native calculator app. You can add explanatory text to numbers to make calculations easier to understand. You can also save and sync calculations to Dropbox. It’s better than running a tape and it’s also fast and intuitive, which is becoming a theme. Evernote – This is the all-around best repository for notes and miscellaneous junk. Most of the non-leisure pictures I take go through Evernote and I often use it as a photocopier. Any text Evernote finds within a picture is searchable, so it’s great for photographing whiteboards and handwritten notes. Safari – It works okay. I do have a few other browsers on the phone, but I’m leaving this one on the home screen because it’s so easy to sync bookmarks (which I don’t do, but I’m planning to get my act together on this). Clock – The native app is simple and functional. Settings – I turn wi-fi off and on a lot because of the all the air travel I’ve been doing lately. I also change my brightness a lot. This needs to be handy. Phone – Rarely do I blow through my 400 minutes, but it is a phone. Messages – Contact me this way for the quickest response. Camera – The camera is maybe the best part of having a smartphone. I even ditched my point-and-shoot because there’s no need for it any more. It allowed me to upgrade my other camera to a Nikon P7000 (2010 version). Reeder – I think this is the most efficient way to bang through blogs, news sites, and miscellaneous feeds. It’s not as pretty as Flipboard or Pulse and doesn’t pull in Facebook or Twitter, but I’m willing to forsake these features for speed and simplicity (in other words, it’s fast and intuitive). It syncs with my Google Reader and has a companion app for OSX. Beautiful app. Instapaper – When I find mid-length or long-form content that I want to read or save, I send it to Instapaper. It’s a joyful reading experience and works great with Reeder and Twitter and about a gazillion other apps. Twitter – This is my primary social network, but I realize it’s much more than just social. I’m not a power user, but I recognize it’s power. I wish more of my contacts were on it. LinkedIn – I don’t use it much, but I should, so it’s here. Maps – I need to find places every so often. Weather – I’m consumed with the weather, like many Chicagoans. Harvest – I need to keep track of my time every day, so I use this. I tried Freshbooks and Harvest about six months ago and this won out. Harvest seemed to have the better mobile app. It’s under constant development. So I have one free space, but I think I’ll always leave a little excess capacity in case I want to test something. I’m up for poking holes in certain decisions. I could see relegating LinkedIn to the back page and I could see adding a quick capture app like Captio or Capture. Also notice that I don’t have Contacts on my home page because I use search to find them. I’ve also been thinking of a notification app (like Boxcar) and a clipboard app (like Pastebot), but I’m still sorting through it. The folks at 37Signals put up a bunch of their home screens if you’re interested in checking them out. I’ll update this if I make significant changes. Hit me up at @quickjstef if you have suggestions. UPDATE: Lifehacker had an app article the other day and they had some interesting ideas. I like the idea of leaving a whole row blank and the idea of having a “holding bin.” I may bat those around. Posted in work, tagged iPhone, productivity on 2012/01/13 by John.